The highest resolution Nikon hybrid model to date, the new Nikon 1 J5 features a 20.8Mp back-illuminated CX-format 1-inch sensor with no Optical Low Pass Filter. 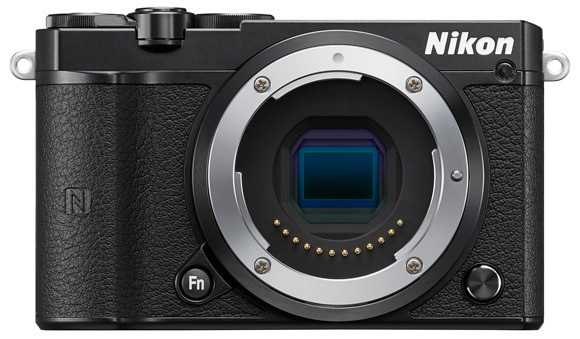 Despite being a little slow off the blocks releasing hybrid cameras, Nikon are well up and running now with the J5 representing their 11th release in less than four years. 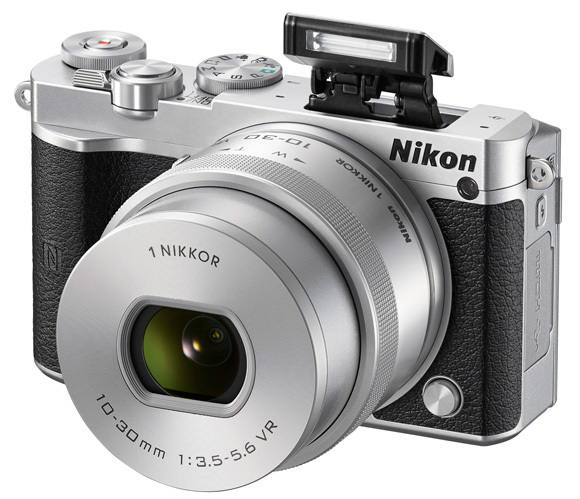 The Nikon hybrid range splits into three clear market segments, with the entry-level S series, advanced enthusiast V range, and in the middle J models that offer a compromise between features and price. 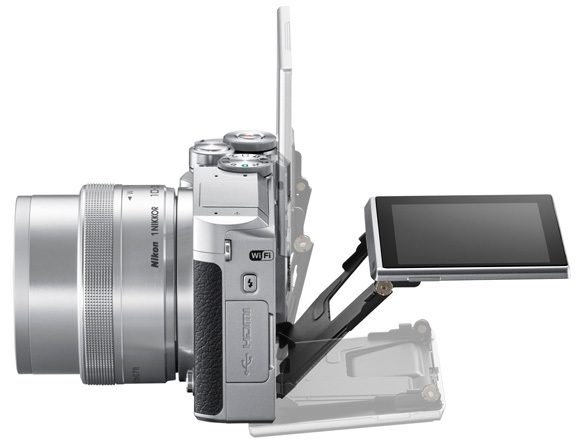 All have been developed around a 1-inch CX-format sensor that’s physically smaller than much of the hybrid competition, such as the APS-C Sony A, Canon M or Samsung NX hybrids, and the FourThirds chip used by Olympus and Panasonic. At the heart of the Nikon 1 J5 is a brand new back-illuminated CX-format sensor with beefier 20.8Mp resolution, up from 18Mp on its predecessor the J4. The new sensor also ditches the traditional Optical Low Pass filter, which is fast becoming the trend on higher resolution sensors, to enable sharper and more detailed images. Historically the Optical Low Pass, or Anti-Aliasing, filter was deployed to prevent the unwanted effect of Moire, or wavy coloured lines, appearing in areas of very fine detail. With bigger 20Mp+ resolutions however sensors now boast enough pixels to capture even the finest detail properly, resulting in the Moire effect becoming less of an issue. The new higher resolution CX-format sensor also enables the Nikon 1 J5 to capture 4K-video (3840x2160s) at 15fps, full HD 1920x1080p at 60/30fps, as well as slow-motion movies recorded at 120fps with a reduced 1280×720 resolution to open up some new creative possibilities for Nikon 1 videographers. Back to stills, the 20.8Mp sensor captures images with 5568×3712 pixel resolution in the standard 3:2 aspect ratio with file formats including 12-bit NEF RAW files as well as compressed JPEGs. ISO sensitivity ranges between ISO 160-12,800 for low-light photography, and a new time-lapse feature shoots either stills at 5, 10 or 30-second intervals, or a full HD time-lapse movie containing up to 300 images. Performance capabilities of the J5 look fairly impressive thanks to a new Sports mode capable of continuous shooting at 20fps, combined with Nikon’s latest EXPEED 5A image processing engine that Nikon claim offers advanced noise-reduction. With no mirror to flip out of the way between each exposure, hybrid cameras are able to shoot much faster frame rates than possible with traditional DSLRs. The Nikon 1 J5 shoots 20fps whilst still auto focusing between each frame, but with the focus locked to the first frame it’ll shoot a staggering 60fps. Focus tracking should keep pace with the action too, thanks to the 171-point hybrid autofocus that features 105 Phase-Detection targets around the centre of the frame with additional Contrast-Detection targets offering coverage towards the edges. The tilting 3.0-inch 1.04m-dot resolution LCD screen can be angled for convenient shooting when composing pictures over a crowd or waist-height for shooting video. It can also be flipped around 180-degrees and features touch-screen controls and the obligatory ‘selfie’ portrait mode that every entry-level camera now has to feature. Whilst that will appeal to a certain segment of the market, the Nikon 1 J5’s lack of a hotshoe for connecting an external flashgun or Electronic Viewfinder will deter the more discerning enthusiast, and means you’re relying on the LCD screen for composition and the built-in pop-up unit for flash. There is however a customisable Fn button on the front for more convenient handling and with both built-in Wi-Fi and NFC enabled image transfer, sharing images directly from the Nikon 1 J5 should be fairly straight-forward. For lens options the dedicated Nikkor 1 range offers around 17 different optics including three ‘fast’ primes covering equivalent 28mm, 50mm and 85mm focal lengths, as well as a range of ‘slow’ variable aperture zoom lenses, and of course Nikon 1 cameras are compatible with DX & FX format F mount lenses via the $237 FT-1 adapter. The new Nikon 1 J5 will be available in three black/white/silver colour combinations from May 2015 priced at €439 body only, €539 with the 10-30mm PD kit lens or €709 for the dual lens kit.